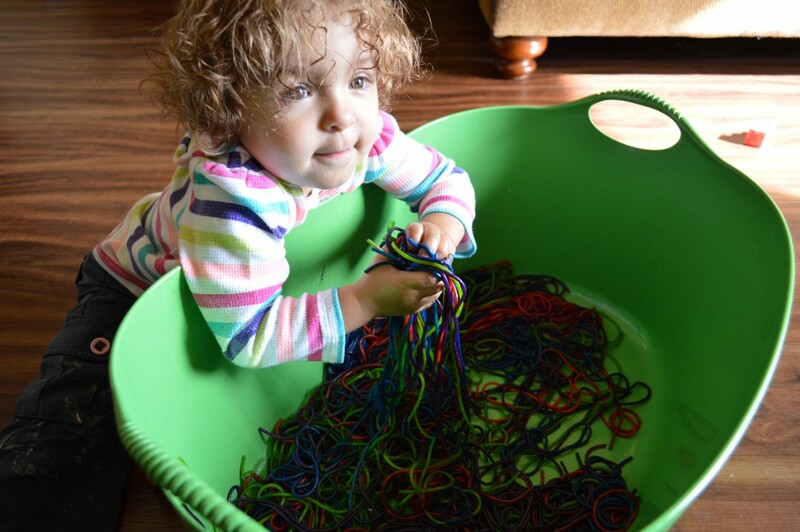 One of the hallmarks of the Montessori Methods is engrossing children in exploring their senses. Tactile play engages children through touch allowing them to explore their surroundings. As a scientist, I can appreciate tactile learning as an introduction to the scientific method. Observation is key and learning about the way objects feel, rough versus smooth; hard versus soft; squishy versus slimy; introduces qualitative analysis and promotes the scientific method as a way of thinking in everyday life. In the Montessori Method, Maria Montessori states, “Although the sense of touch is spread throughout the surface of the body, the exercises given to the children are limited to the tips of the fingers, and particularly, to those of the right hand.” The goal in sensorial learning under the Montessori method is to allow children to immerse themselves in the activity using all five senses if possible and to not limit the activity to just their hands. 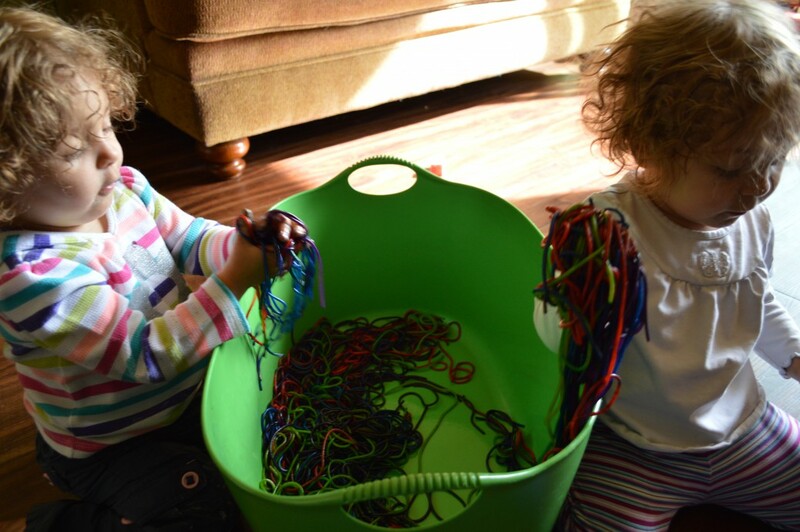 I introduced colored pasta to my girls around 15 months. Initially they just looked at it. When they saw how I picked up handfuls and let it fall through my fingers they did the same. Eventually, I didn’t need to initiate the activity and by 18 months, they were rolling the noodles between their fingers, pulling handfuls up high and slowly letting them drop noodle by noodle. They began to pick out specific colors and organize them into piles by color and even smelling the pasta. And of course, as toddlers will do, they tried eating some of the pasta. Here is how I did it. Boil the pasta according to the package directions. I used ordinary spaghetti but you can add any type of noodles to enhance the sensory effect of the differing shapes. Drain pasta and allow to cool to touch. You want the cooked pasta to be moist but not dry, moistened pasta tends to absorb the colors better than wet and if too dry the pasta will begin to stick to each other. Take a handful of cooked noodles and add it to the zip top bag. Starting with the lightest color, add food coloring to the noodles using as much or as little to achieve the desired color. Zip the bag allowing an air pocket, and shake to disperse the color. Add more color if needed and shake again. Place the colored pasta into the tub and repeat this process until you have colored all the noodles ending with the darkest color. Add the oil to the colored pasta and toss to coat. This keeps the noodles from sticking together and also adds that extra sensorial effect of the noodles being smooth and slippery. The noodles are now ready for play. I use my noodles as single use, throwing the noodles to the pets or into the compost. My babies like to eat the pasta and after playing, the noodles can harbor bacteria that may induce foodborne illness. We began our adventure with the noodles fully clothed, in the living room, on wood flooring but ended in the bath in our diapers. 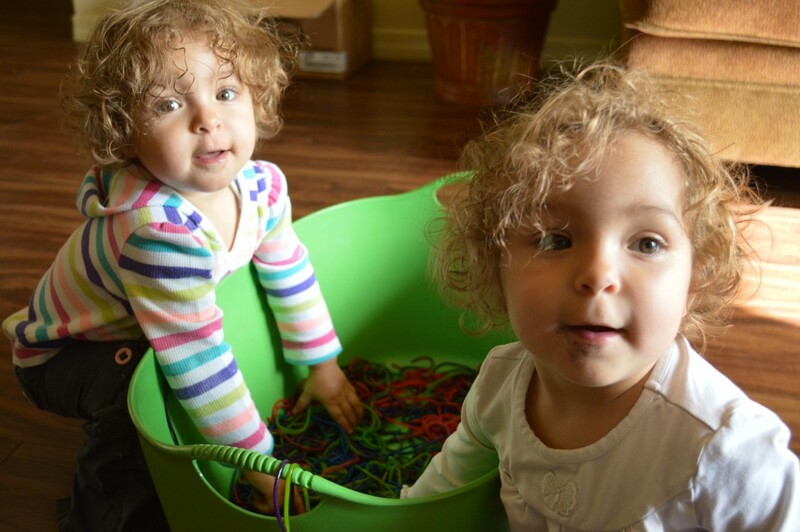 The twins enjoyed wearing the pasta, eating the pasta, and putting it in each other’s hair. When we were done a quick rinse of the tub and babies in the shower added an extra sensory activity as the water rinsed away the excess color and each of the colors bled together. I LOVE THIS! I Cannot WAIT to give it a try! You are a mommy Genius!!!!! Thank you for sharing!